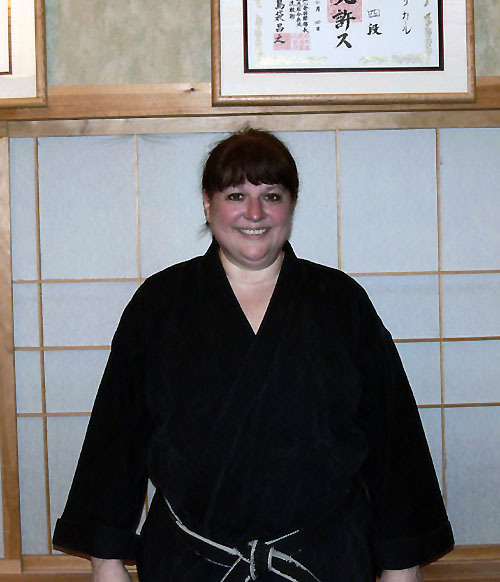 Kathy Lantz has been training in Shorin Ryu Karate under Carl Long Sensei Since 1991. She became interested in Karate while watching her children taking class at Sakura. Kathy began her training when her children were in grade school an although the children grew up, graduated high school and left home(and Sakura), she stayed and continued to train. A Go-Dan in Shorin Ryu Karate, Kathy describes her involvement in Karatedo as the biggest (and best) surprise of her life. When not in the dojo, Kathy is a marketing consultant and directs the advertising/marketing program at A. Rifkin Co. in Hanover, Pa. She has an MBA degree from Wharton School of the University of Pennsylvania and has taught marketing management classes at Kings College and the Univeristy of Scranton. Prior to moving to the Wyoming Valley, Kathy worked as a product manager for Bristol-Myers Corp. in New York City. Kathy lives in Kingston with her husband, Paul and dog, Beau.